Arvydas Romas Sabonis Lithuanian pronunciation: ​[ˈaːrviːdaːs ˈsaːboːnʲɪs]; born December 19, 1964) is a Lithuanian retired professional basketball player and businessman. Recognized as one of the best European players of all time, he won the Euroscar six times, and the Mr. Europa Award twice. He played in a variety of leagues, and spent seven seasons in the National Basketball Association (NBA), in the United States. Playing the center position, Sabonis won a gold medal at the 1988 Summer Olympics, in South Korea, for the Soviet Union, and later earned bronze medals at the 1992 Olympic Games and 1996 Olympic Games, while representing Lithuania. He retired from professional basketball in 2005. Sabonis was selected by the Portland Trail Blazers, in the first round of the 1986 NBA draft, but he did not play his first NBA game until the age of 31, in 1995. Sabonis is considered one of the best big man passers, as well as one of the best overall centers, in the history of the game. Bill Walton once called Sabonis, "a 7 ft 3 in (2.21 m) Larry Bird", due to his unique court vision, shooting range, rugged in-game mentality, and versatility. On August 20, 2010, Sabonis was inducted into the FIBA Hall of Fame, in recognition of his great play in international competition. On April 4, 2011, Sabonis was named to the Naismith Memorial Basketball Hall of Fame, and he was inducted on August 12, 2011. At that time, he was the tallest player to ever enter the Naismith Memorial Basketball Hall of Fame; one year later, he would be surpassed by 7 ft 4 in (2.24 m) Ralph Sampson. On October 24, 2011, Sabonis was voted as the next President of the Lithuanian Basketball Federation, replacing Vladas Garastas, who had led the LBF since 1991. He resigned from the position on October 2, 2013, but came back to it on October 10, 2013. Born in Kaunas, Lithuanian SSR, Soviet Union, Sabonis began playing basketball at age 13. By the time he was 15 years old, he was a member of the Soviet national junior team. Sabonis escaped conscription to the Soviet Army, by enrolling at the Lithuanian University of Agriculture, in his hometown. Sabonis made his professional club debut in 1981, with one of the oldest basketball teams in Lithuania, Žalgiris, in his hometown of Kaunas. With the club, he won three consecutive Soviet Premier League titles, and the 1986 FIBA Club World Cup (FIB Intercontinental Cup). In 1989, Sabonis left Žalgiris, and signed with the Spanish Liga ACB club Fórum Valladolid. In 1992, after playing with Fórum Valladolid for three seasons, Sabonis joined Spanish club Real Madrid, and with them, he won two Spanish League titles, and a EuroLeague title, in 1995. During the 1994–95 regular season with Real Madrid, he averaged 22.8 points, 13.2 rebounds, 2.6 blocked shots, and 2.4 assists per game. Sabonis was originally selected by the Atlanta Hawks, with the 77th overall pick, of the 1985 NBA draft. However, the selection was voided, because Sabonis was under 21 at the time of the draft. The following spring, he suffered a devastating Achilles' tendon injury. Nevertheless, he was selected by the Portland Trail Blazers, with the 24th overall pick of the 1986 NBA draft. Sabonis was not allowed to play in the US, despite LSU Tigers head coach Dale Brown's plans to have Sabonis studying and playing at Louisiana State University, and thus keeping him in an amateur status. However, he did go to Portland, to rehabilitate his injury with the Blazers medical staff, in 1988, while also practicing with the team. After the 1994–95 European season, Sabonis and Portland contacted one another about a move to the NBA. Before signing Sabonis, Portland's then-general manager, Bob Whitsitt, asked the Blazers team physician to look at Sabonis' X-rays. Illustrating the impact of Sabonis' numerous injuries, Whitsitt recalled in a 2011 interview, that when the doctor reported the results, "He said that Arvydas could qualify for a handicapped parking spot, based on the X-ray alone." Nevertheless, the Blazers signed Sabonis. He had a successful rookie campaign, averaging 14.5 points, on 55% shooting, and 8.1 rebounds per game, while playing less than 24 minutes per game. Sabonis was selected to the All-Rookie First Team, and was runner-up in both Rookie of the Year and Sixth Man of the Year voting. His postseason averages went up to 23.6 points and 10.2 rebounds per game. In the first playoff series of his NBA career, Portland lost to Utah, in five games. Sabonis averaged 16.0 points, 10.0 rebounds, and 3.0 assists per game, in 1997–98, all career-highs. During Sabonis' first leg in Portland, the Blazers always made the playoffs (part of a 21-year streak); between 1998 and 1999, the Oregon franchise changed large parts of its roster, in order to compete for the NBA Championship (after six consecutive first round losses), with center Sabonis the only player remaining in the starting five. Kenny Anderson and Isaiah Rider were traded for Damon Stoudamire and Steve Smith. In both those years, the Blazers reached the Western Conference Finals; in 1999 they were swept by the eventual champions, the San Antonio Spurs, while the next year, the team (starting Sabonis, Smith, Stoudamire, Rasheed Wallace, and recently added Scottie Pippen) lost to the Los Angeles Lakers (at the beginning of the team's three-peat), in seven games. The question that frequently surrounds Sabonis' NBA career revolves around how good he could have been, had he played in the NBA during his prime. Sabonis was nearly 31 when he joined the Blazers, by which time he had already won multiple gold medals, suffered through numerous injuries, and had lost much of his mobility and athleticism. In Bill Simmons' "Book of Basketball", Arvydas Sabonis the international player is idealized, while Arvydas Sabonis the Blazer, is described as "lumbering up and down the court in what looked to be concrete Nikes", and ranking "just behind Artis Gilmore on the Moving Like a Mummy Scale." In ESPN's David Thorpe's view, Sabonis would be the best passing big man in NBA history, and possibly a top 4 center overall, had he played his entire career there. In Clyde Drexler's view, if Sabonis had been able to spend his prime in Portland, next to the plethora of other Trail Blazers' All Stars (Drexler, Terry Porter, Buck Williams and Cliff Robinson), the Trail Blazers would "have had four, five or six titles. Guaranteed. He was that good. He could pass, shoot three pointers, had a great post game, and dominated the paint." After the 2000–2001 NBA season, Sabonis refused to sign an extension with the Trail Blazers and retired from the NBA. In his own words, he "was tired mentally and physically." Instead, he returned to Europe, where he signed a one-year deal, at a nominal salary, with Žalgiris Kaunas, expecting to join the team for the most important games of the season down the stretch. However, he ended up missing that season in its entirety, and resting and recovering from injuries. Sabonis rejoined the Trail Blazers for one final season, in 2002–2003. He won the Euroscar twice, while playing with the Blazers. He also became a fan favorite, and had a warm welcome back when he visited Portland in 2011, en route to being enshrined into the Naismith Hall of Fame. Sabonis came back to Žalgiris to play his final season, in 2003–04. He led the team to the Top 16 stage of the EuroLeague that year, and was named the Regular Season MVP and the Top 16 MVP. He also became the team's President. Sabonis would officially retire from playing professional basketball, in 2005. Sabonis, a member of the Soviet Union national team, taking on David Robinson and Danny Manning, during the semifinal clash with Team USA, at the 1988 Olympics. The Soviets scored an 82–76 win, with Sabonis contributing 13 points and 13 rebounds. In 1982, Sabonis was one of the players in the senior Soviet Union national team that toured the United States, playing against various college basketball teams. Despite being recommended to rest, instead of playing in the 1988 Summer Olympics, the Soviets allowed Sabonis to remain a part of their national team. Sabonis led the Soviet Union to a gold medal, with a win against a United States team that featured future NBA All-Stars David Robinson, Mitch Richmond, and Danny Manning in the semifinals. This was the last American Olympic team that was not composed of active NBA players. The team later beat Yugoslavia in the finals. In his career with the senior Soviet national team, Sabonis also played at the following major tournaments: the 1982 FIBA World Championship (gold medal), the 1983 EuroBasket (bronze medal), the 1985 EuroBasket (gold medal), the 1986 FIBA World Championship (silver medal), and the 1989 EuroBasket (bronze medal). He was named to the EuroBasket All-Tournament Team in 1983 and 1985, and he was named the EuroBasket MVP in 1985. The 1985–1988 stretch of a heavy playing schedule, and lack of rest, took a significant toll on Sabonis' future health and durability. Various leg injuries were not given much time to heal, due to the Cold War climate that surrounded international competition, as well as the intense rivalry of the Žalgiris Kaunas versus CSKA Moscow games in the USSR Premier League. In a 2011 interview, Sabonis expressed an opinion, that overuse by the coaches of the Soviet national program, was a major contributing factor to his first Achilles' tendon injury, back in 1986. Another key moment for his future health, took place in 1988, when Sabonis had a surgical Achilles procedure performed in Portland, but was rushed back on the floor with the USSR Olympic team, before a full recovery. The decision to include a limping Sabonis, on the USSR roster for the 1988 Olympic Games, was protested at the time by the Portland medical staff, and was later heavily criticized. While the Soviets cleared him to play professionally in 1989, when his Soviet national teammate, Šarūnas Marčiulionis, went to North America, Sabonis postponed his travel, over feeling that he was not physically ready for the NBA. Eventually, Sabonis would develop chronic knee, ankle and groin issues, that substantially limited his mobility and explosiveness, by the mid-1990s. After breakup of the Soviet Union, and the independence of Lithuania, Sabonis then became a member of the senior Lithuanian national team. He represented Lithuania at the following major tournaments: the 1992 Summer Olympic Games (bronze medal), the 1995 EuroBasket (silver medal), the 1996 Summer Olympic Games (bronze medal), and the 1999 EuroBasket. He was named to the EuroBasket All-Tournament Team in 1995. Sabonis was also awarded a silver medal at the 2013 EuroBasket tournament, due to being the Lithuanian Basketball Federation (LKF) President. Sabonis is married to Ingrida Mikelionytė, the first Miss Lithuania, a fashion model, and a movie actress. They have a daughter named Aušrinė, and three sons: Žygimantas, Tautvydas, and Domantas – the last two being born in the cities his father was playing, Valladolid and Portland. Once Sabonis left the NBA, the family moved to the Spanish coastal city of Málaga. Domantas was drafted 11th overall in the 2016 NBA draft, and currently plays for the Indiana Pacers. Žygimantas, and Tautvydas decided to continue their careers in Europe. 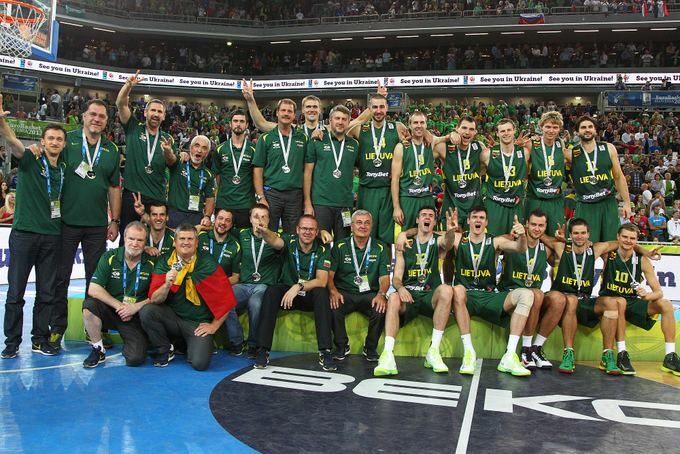 Both Domantas and Tautvydas played for the Lithuania national team in different levels of competition. In September 2011, Sabonis suffered a heart attack, while playing basketball in Lithuania. Doctors said that the heart attack was not life-threatening. According to his son, Domantas, Arvydas is a huge fan of the Boston Celtics, his favorite basketball player is Larry Bird and his favorite color is green. Note: The EuroLeague is not the only competition in which the player participated for the team during the season. He also played in domestic competition, and regional competition if applicable. Pop/rock band Margot & the Nuclear So and So's, recorded a song dedicated to Arvydas Sabonis, on their 2012 album Rot Gut, Domestic. He appeared on the Lithuanian cover of the video game NBA Live 2001. ^ "Where's Walton ... Day 15: West Coast Reflections". NBA. ^ "FIBA announces 2010 Hall of Fame Class". FIBA. 2010-08-20. Archived from the original on 2010-10-19. ^ "Rodman, Mullin, Winter named to Naismith Hall of Fame". NBA. 2011-04-04. Archived from the original on 2011-04-07. ^ a b c d e f g h i "Arvydas Sabonis Bio". NBA.com. Retrieved February 27, 2010. ^ "Perestroika and Lithuanian Basketball" (PDF). la84.org. ^ "Prisiminimai apie A. Sabonio fenomeną ispaną privertė atsiprašyti P. Gasolio". Krepsinis.lt. Retrieved 28 April 2017. ^ a b c d e "The Old College Try: The complicated recruiting sagas of Arvydas Sabonis and his son Domantas". Sports Illustrated Longform. ^ Abrams, Jonathan (August 16, 2011). "Arvydas Sabonis' Long, Strange Trip". Grantland,com. Retrieved November 28, 2011. ^ Whittell, Ian (May 2, 2008). "Best of the Euroleague and NBA: Arvydas Sabonis". ESPN.com. Retrieved February 27, 2010. ^ Quick, Jason (February 27, 2010). "Blazers Top 40: No. 20 Arvydas Sabonis". OregonLive.com. Retrieved February 27, 2010. ^ "The Bill Simmons Typo That Insulted an Entire City". blazersedge.com. ^ "Chat with David Thorpe". go.com. ^ "Chat with Clyde Drexler". go.com. ^ "BOREDOM BRINGS SABONIS BACK TO BLAZERS". highbeam.com. 1 October 2002. Archived from the original on 5 November 2012. ^ Lyslo, Erik. "Portland Will Miss Arvydas Sabonis". Retrieved February 27, 2010. ^ "A Summer Day With Sabonis". nba.com. ^ "50 Greatest contributors list: Arvydas Sabonis". euroleague.net. Archived from the original on 27 January 2010. Retrieved February 27, 2010. ^ Lithuania Calling Also Winn, Luke (August 15, 2011). "Lithuania Calling". Sports Illustrated. 115 (6): 52–56. ^ Times, Esther B. Fein and Special To the New York. "Sabonis Is Named To Soviet Team". nytimes.com. ^ Vecenie, Sam (April 8, 2016). "Gonzaga's Domantas Sabonis, son of Hall of Famer, is ready for NBA Draft". CBSSports.com. Retrieved April 14, 2016. ^ "Former NBA star Sabonis stable after heart attack". newsday.com. ^ ""Celtics" peržiūroje dalyvavęs D.Sabonis atskleidė įdomų faktą apie savo tėvą ir žaidimo elementą, kurį nori patobulinti labiausiai". Krepsinis.net. Retrieved 9 June 2016. ^ "Arvydas Sabonis Stats - Basketball-Reference.com". Basketball-Reference.com. Wikimedia Commons has media related to Arvydas Sabonis.